All Saints' Day is a Christian holiday which honors the lives of saints and martyrs. The celebration of this day expresses gratitude for their unique contributions and sacrifices, and acknowledges their continued spiritual presence in the lives of people today. It is celebrated on November 1st in Western churches and the first Sunday after Pentecost in Eastern rite churches. In the early church, Christians would acknowledge the anniversary of a martyr's death at the place of martyrdom. Sometimes groups of martyrs suffered death together on the same day. This gave rise to larger commemorations. Over time, the church, feeling that every martyr should be venerated, appointed a common day for all. This practice is believed to be the origin of All Saints Day. Similar acknowledgments of those who have passed on are present in many traditions, including Buddhism, Shintoism, Shamanism, Hinduism. There is a widespread understanding common to all the major religions that human beings are most essentially spiritual beings who live on eternally as spiritual beings after their physical lives have ended. The first trace of a general celebration for the martyrs is attested in Antioch on the Sunday after Pentecost. This custom is also referred to in the 74th homily of John Chrysostom (407) and is maintained to the present day in the Eastern Orthodox Church. The origin of the festival of All Saints as celebrated in the West however, now is said by the Roman Catholic Church to be somewhat doubtful. On May 13 in 609 or 610 (the day being more important than the year), Pope Boniface IV consecrated the Pantheon to the Blessed Virgin and all the martyrs, and the feast of the dedicatio Sanctae Mariae ad Martyres has been celebrated at Rome ever since. The chosen day, May 13, was a pagan observation of great antiquity, the culmination of three days of the Feast of the Lemures, in which the malevolent and restless spirits of all the dead were propitiated. The medieval liturgiologists based the idea that this Lemuria festival was the origin of that of All Saints on identical dates and on the similar theme of all the dead. This connection has now been abandoned by Roman Catholics. Instead, the feast of All Saints is now traced to the foundation by Pope Gregory III (reigned 731–741) of an oratory in St. Peter's honor for the relics "of the holy apostles and of all saints, martyrs and confessors, of all the just made perfect who are at rest throughout the world," with the day moved to November 1. Common commemorations of the deaths of martyrs by several churches first began to be celebrated in the fourth century. So far as the Western Church generally is concerned, the November festival of all the saints was already widely celebrated in the days of Charlemagne; it was made a day of obligation throughout the Frankish empire in 835, by a decree of Louis the Pious, issued "at the instance of Pope Gregory IV and with the assent of all the bishops," which confirmed its celebration on the first of November. These commemorations led to the development of festivals and the festival of All Saints, also sometimes known as "All Hallows," or "Hallowmas," which became a kind of feast celebrated in their honor. Thus, All Saints is a Christian formula invoking all the faithful saints and martyrs, known or unknown. The Roman Catholic holiday (Festum omnium sanctorum) falls on November 1, followed by All Souls' Day on November 2, and is a festival of the first rank with a vigil and an octave. The Eastern Orthodox Church's All Saints is the first Sunday after Pentecost and as such marks the close of the Easter season. There are celebrations in Portugal, Spain, and Mexico, where ofrendas (offerings) are common. In Portugal and France, people would (and continue to) offer flowers to dead relatives. The traditional Portuguese Halloween, known as dia das bruxas (witches' day) is observed in the night of April 30 to May 1; it is not related to All Saints Day and is not widely celebrated. 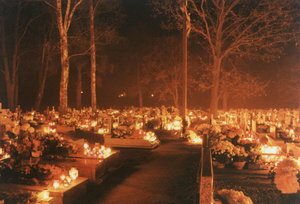 In Poland, the tradition on this day (known as Zaduszki) is to light candles (znicze) and visit the graves of deceased relatives. The festival was retained after the Reformation in the calendar of the Church of England and in that of many of the Lutheran churches, as well as those of other Christian denominations. In Lutheran and other Christian traditions, these festivals have largely disappeared, in spite of efforts to revive them. In the Lutheran churches, such as the Church of Sweden, All Saints Day assumes a role of general commemoration of the dead (similar to the All Souls commemoration in the Eastern Orthodox Church that takes place two Saturdays before the beginning of Lent). In the Swedish calendar observance takes place on the first Saturday of November. Again, many religious traditions within and beyond Christianity have designated special days where not only unique saints and martyrs are venerated, but also common ancestors are honored and remembered in special ways and recognized for their on-going connection and influence in the actual lives of families and communities. History of "All Saints Day"
This page was last modified on 7 March 2016, at 22:04.